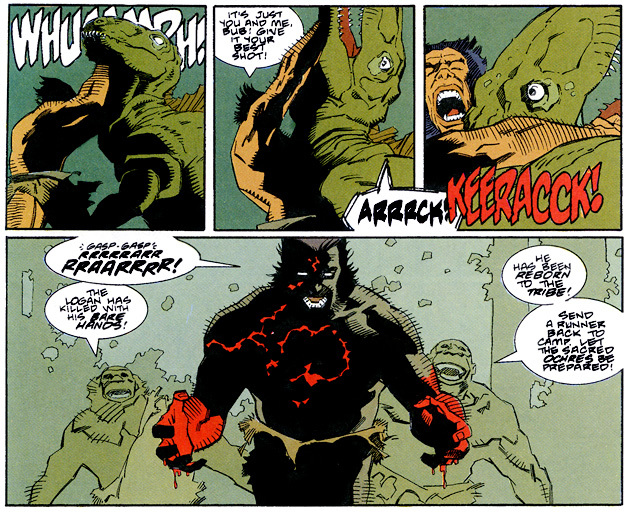 Wolverine in the Savage Land, wrasslin’ dinosaurs. Walter Simonson riffing on Turok: Son of Stone. Mike Mignola channeling Frazetta. 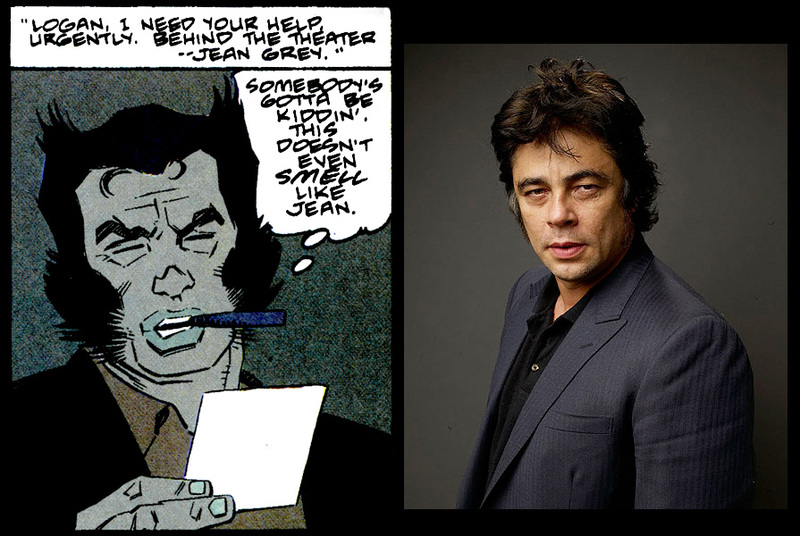 And for some reason Logan is played by Benicio Del Toro in this comic. All that makes for a book worth checking out, right? Wolverine: The Jungle Adventure is a Marvel Comics prestige format (thin, squarebound, advertising free, small graphic novel) from 1990. In it, we find a self contained story in 48 pages. Light on continuity, easy on the eyes, the book stands out from many of the other Marvel releases of the time. Unlike the book featured in our previous Marvel prestige review, Ghost Rider / Wolverine / Punisher: Hearts of Darkness, this release isn’t accompanied by any such gimmicks as a four page fold out cover spread, nor burdened by a fanserving crossover. In fact, it’s a straight up Wolverine book, nary a fellow X-Man in sight. Of course, Logan himself may be more than enough to draw in the true believers. My favorite stories from this era were the Patch tales penned by Claremont in Wolverine’s new ongoing (and collected in Wolverine Classic). This book ties in well enough there. The short and hairy adventurer is sent a ticket to a Broadway premiere, where he’s pulled into a confrontation with some kind of cyborg assassin. That’s a pretty standard day for a Marvel hero, but the cyborg also smells of the Savage Land, a patch of terraformed earth in the Antarctic where dinosaurs still roam. The conflict eventually leads to Apocalypse (this isn’t a spoiler ’cause the guy is on the cover) and some enjoyable mayhem. Walter Simonson‘s story is straightforward, narrated by the prehistoric-style shaman of the “Man-Apes” (not expressly named in this book). There are always some issues that will rear their head around portrayal of tribe social structures by western white culture, but this book is nowhere near the travesty of Avatar. 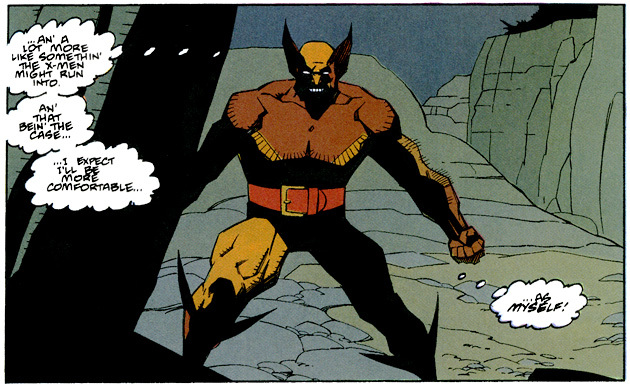 Of course Wolverine ends up as the honored member, but we all know he is the best there is at what he does. 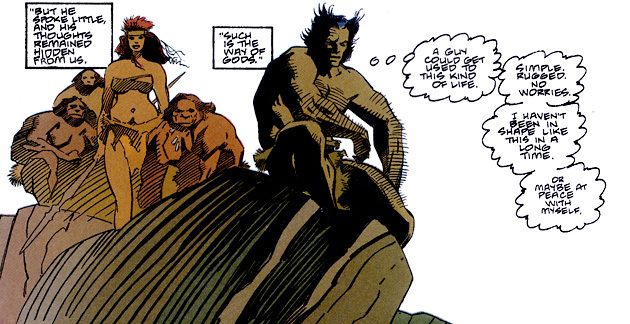 And the Man-Apes are kind of portrayed as of a semi-Caucasian heritage, though everyone (including Logan) is darkly colored. Anyway, the story isn’t about Dances with Wolves style white guilt, it’s about punching dinosaurs and tearing up cyborgs. 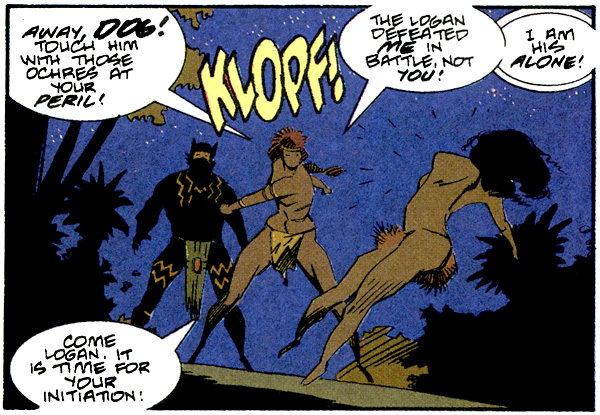 And you’ve got to have some kind of prehistoric tribe to put the conflict in context, right? So let’s let it slide, this once. Points to the creators for having a Frazetta-style female with some variety to her character. Gahck is strong and intimidating, a far cry from the disappointing archetype we encountered back when we reviewed Tor Vol. 3 [NSFW] (which actually came out after The Jungle Adventure.) The book won’t win any points for female bonding or pass the Bechdel test, but at least the relationships here aren’t entirely predictable. There’s some cheesecake, but much more for those interested in Mr. Howlett’s well-furred chest. Far too many writers take the easy and predictable way out in portraying tribalism and women, so it’s always nice to get a story that I can read without cringing. Cringing too much, anyway. Moving past the social aspects, I wanted to make some brief notes about this book’s place in Marvel continuity. I said it was pretty light, but there are a few things of interest. 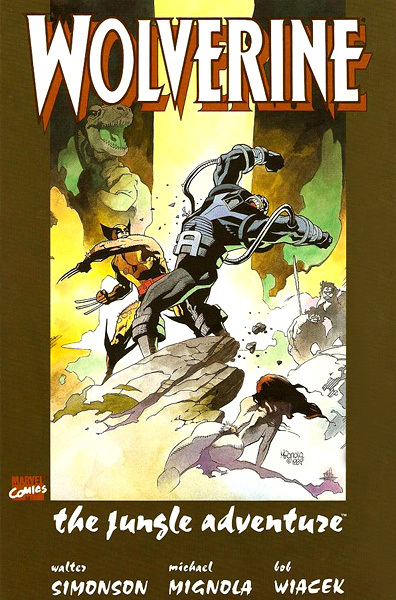 Tthis book apparently features Wolverine’s first meeting with Apocalypse, who had only been around for a few years at this point, and only in X-Factor. As far as I know, the above hasn’t been reflected at all in modern continuity, but if you’re keeping track, it was a bit of a WTF moment on the last page, because I’d forgotten all about it. Simonson’s enjoyable story aside, the real draw of this book was definitely Mike Mignola‘s art. I’m not deep enough in the Marvel Universe to follow every character or title, so when I impulse buy it’s often for exciting illustration or some really wacky premise; this book had a bit of both. Mignola is, of course, the progenitor of Hellboy, which he’s currently most well known for. He’s done a fair amount of work on superhero titles, but the ones I have are relatively obscure. For DC, there was the Starlin penned Cosmic Odyssey and the finally collected Batman/Starman/Hellboy crossover. On this title, Mignola is perfect. His prehistoric denizens are a combination of hulking frames and moving expressions. His backgrounds are sparse, but perfectly composed. His dinosaurs are appropriately menacing and evil lairs full of the requisite mechanical doodads. 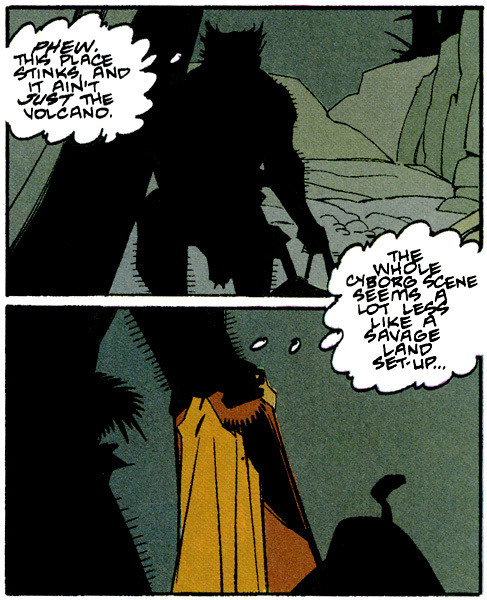 Mignola’s strength has always been in creating panels full of drama and tension, composed almost entirely of shadow and the odd figure. There’s plenty of that here, but also some moving portraits and more tender moments. I mentioned earlier that Wolverine seems to be played by Benicio del Toro. It was a silly remark, but I hold to it. I hope you don’t take it as a negative, because I’d certainly see a film with that casting. It’s the big lips and squinty eyes – sometimes sad, mischievous at the best of moments, and full of rage when you’d expect. As for Gahck, she’s shapely and powerful. I admire the way Mignola has drawn the women. Great beauty combined with realistic proportions. There is the odd Liefield foot (angled to a suggested point instead of fully fleshed) and many feet hidden behind cleverly placed tiny hills – but you don’t really notice this unless you’re nitpicking for it. And I actually like the dynamic motion reinforced by those slashed foot impressions, especially in silhouette. Mignola more than makes up for a few cropped feet by perfectly rendering an entire sequence starring Logan’s little piggies. They are the best there is at what they do. Finally, the villain is a lot of fun to look at. 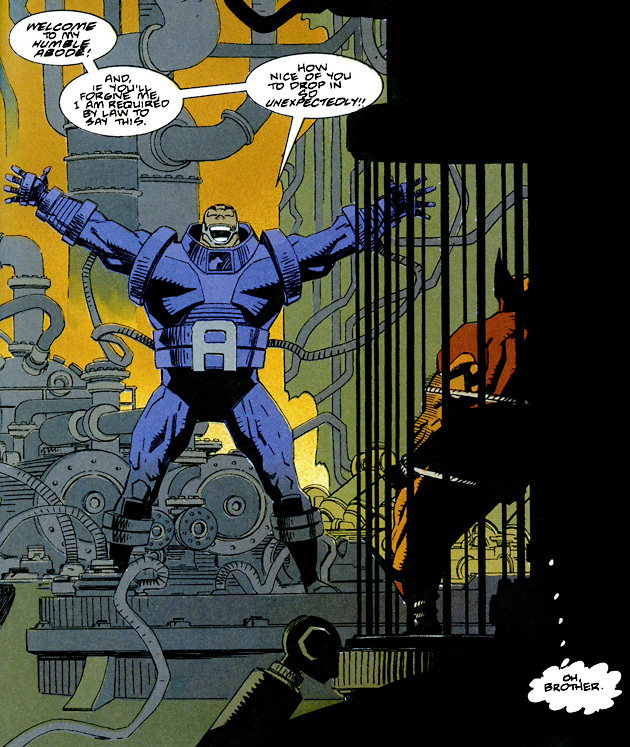 I’ve always thought Apocalypse had a kind of silly design (like many Marvel characters, I’ll admit) but here his armor is downplayed into a single color and form, while his head is given a gigantic mouth reminiscent of South Park’s Canadians. I love it, he’s like a giant evil Muppet. Maybe that’s not what you’re looking for in your Apocalypse, but it tickled me. Wolverine: The Jungle Adventure tells a tale of action that could take up a miniseries of four times the size in today’s comics. It’s compact, well paced, and accompanied by some sterling art. And this book can be found for a dollar at many used comic shops! 4 out of 5 stars. This adventure gives a lot of bang for your buck, especially if you like Mignola’s artwork, all wrapped into a tasteful little prestige book. Not really. While Wolverine himself is central to the Marvel Universe, this book isn’t. There are some events in here that reflect continuity and plenty of name dropping, but I highly doubt anything is essential. It’s a good display of Logan’s character, though, one of his more enjoyable stand-alone stories. There has been intense debate about good starting places for Wolverine. His original introduction (collected in many places, such as Wolverine Battles The Incredible Hulk) is of interest mostly to aficionados, as his battle with The Hulk doesn’t have much of what makes him so lovable today. The Weapon X miniseries is kind of tough to start with as well, since it answers many questions but also spoils some of the intrigue involved in his early stories. It’s quite possible that the best way to get introduced, for someone entirely new to the X-Men family, is watching the X-Men movies. 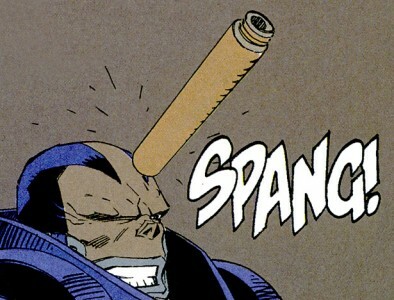 It’s how my fiance did it, and she now understands him as well as most comic fans. Plus Hugh Jackman, rawr. If I had to direct you to a single volume, I would suggest the oversized hardcover The Best Of Wolverine Vol. 1. That book collects his first appearance in The Incredible Hulk, the 1982 Frank Miller/Chris Claremont miniseries, a crossover with Captain America, Uncanny X-Men #205, and the Weapon X story from Marvel Comics Presents, which I mentioned before. Reading that book straight through is as good an introduction to the character as any I’ve found – and a lot of the other “origins” books will only serve to thoroughly confuse a new reader. You can simply follow the Wolverine tag list to read all his books in order. I highly recommend the Wolverine Classic trade series, which was also from this era. Marvel Comics Presents Wolverine was a favorite when I was a kid, but I honestly can’t tell you if it’s any good from recent experience. Hopefully I’ll review them soon! Damn Man! You didn’t even take a day to enjoy having the Marevl list up before posting a review, you’re unstoppable! It’s nice to see a review for a prestige and I’m impressed that you’re able to have enough material with it for an adequate review. I like that darker looking wolverine, but I’m glad they finally revealed that Apocalypse is the “long lost Evil Muppet!” That must have been why Beaker was always so skidish. this by Woodside Biomedical Inc.
Tulisan Emilay Authentic” sedikit lebih besar dan warna hitam tidak terlalu dalam terkesan sedikit pucat.